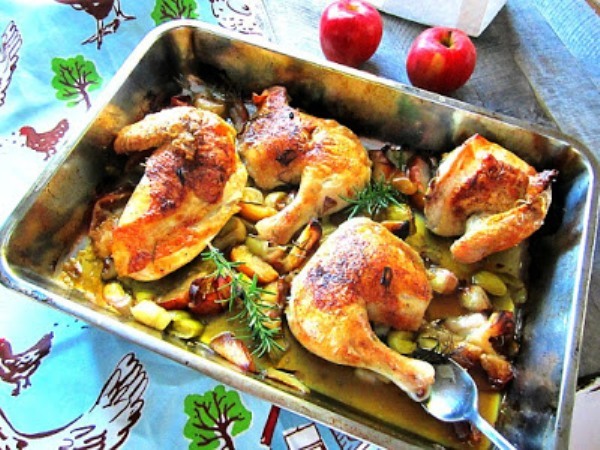 Lay the chicken legs and breasts in a roasting pan. Nestle the leeks and apples around the chicken. Drizzle everything w/ olive oil and season w/ kosher salt & pepper. Lay rosemary sprigs on top. Roast in a 425F oven for 55 minutes. You should have a nice sauce to spoon over the chicken. Labels: Chicken With Apples & Leeks, fresh rosemary, kosher salt, olive oil, pepper, roasting pan.